What’s the phase of the moon on [insert date here]? Do it in your head. This is something I found on the Internet once, don’t know where; I learned it but eventually forgot it. Having put it back together again I’m posting it here for future reference. It’s more or less similar to the method, attributed to John Conway, described at much greater length at http://gmmentalgym.blogspot.com/2013/01/moon-phase-for-any-date.html. The two are not mathematically equivalent, though, giving slightly different results for some dates. See below. To start with, assume the required date is in the range from 1 Jan 2000 to 31 Dec 2018. Take the last two digits of the year, add 2, and multiply by 11. Now add the number of the month — 1 for January, 2 for February, and so on, 12 for December. If the month is January or February, add another 1. Now add the day of the month. Now divide that number by 30 and take the remainder. The result is, approximately, the age of the moon — the number of days since the new moon. 0 or 29 would be new moon, 14 or 15 would be full moon, about 7 would be first quarter, about 21 would be third quarter. It might be off a day or so (again, see below), but close enough for mental calculation, right? What about dates outside that range? The moon returns to the same phase every 19 years exactly — or almost exactly; actually more like 19 years plus 2 hours. This is called a Metonic cycle. So add or subtract a multiple of 19 years to get into the 2000–2018 range and then proceed as above. Obviously for dates far in the past or future this breaks down, but for dates in the past or future few decades it’s fine. Example: July 20, 1969. This is outside our 2000–2018 range but if you add 2×19=38 years you have July 20, 2007. So: for year 2007, (7+2)x11 = 99; for month 7 add 99+7=106; for day 20 add 106+20=126. To get the remainder when divided by 30, subtract the multiple of 30: 126-120=6. Age of the moon is 6 days, corresponding to just about first quarter. Of course July 20, 1969 is the date of the Apollo 11 landing. If you do the same for the other moon landing dates you get ages in the range 5 to 9. For reasons having to do with the angle of the Sun, NASA chose to do all the moon landings at about first quarter. Example: January 1, 2018. (18+2)x11 + (1+1) + 1 = 223; 223-210=13. The moon is (about) 13 days old on New Year’s Day, so is close to full. In fact full moon occurs at about 2:00 UTC on January 2, or evening of January 1 in the United States. We get two full moons in January and March, none in February! How well does this work? It depends on how you define “how well”. You’re getting an integer estimate of the age of the moon, which you can compare to the actual age of the moon… when? At 00:00 UTC? Noon? 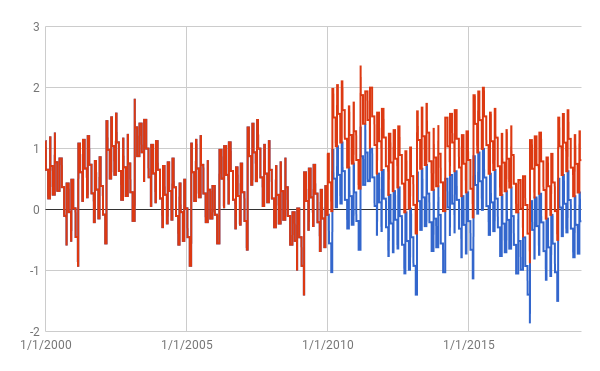 Choosing to compare to the age at 00:00 UTC, here’s a plot of the error in this calculation for the years 2000 to 2018. There are just two dates where it’s more than 1.6 days off and most dates — 6269 out of 6940 —are less than 1 day off. For years outside this range but within the nearest 4 Metonic cycles each way (i.e. from 1 Jan 1924 to 31 Dec 2094) I find there are only two dates where the error is (slightly) larger than 2 days, and average errors in each cycle are under 0.35 days. Outside that 171 year range it gets worse. And here’s a comparison to the results of the method from gmmentalgym. The blue line is the same as above and the red line is gmmentalgym; they coincide for the first 10 years so you see only the red there. After that they differ by 1 day. You can see gmmentalgym is systematically high in the second half of the cycle, so does worse. 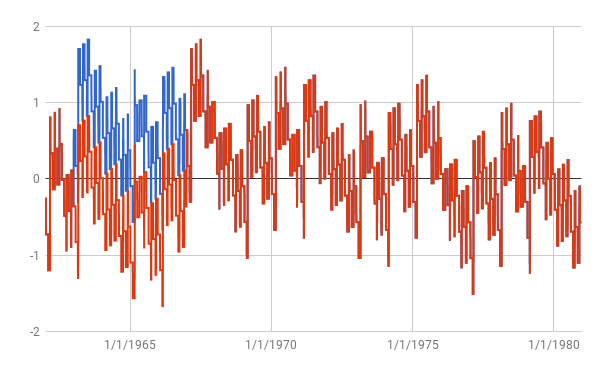 Note, though, that if we compared to the age at noon UTC, it would shift this whole graph down by half a day and the red line would be better than the blue. Here it looks like the gmmentalgym method is a little better, but would be much worse if comparing at noon UTC. On balance, I wouldn’t say either method has the clear upper hand — they’re both decent approximations, easily done in one’s head.